If you are experiencing neck pain or lower back pain you may wonder if you have a bulging or herniated disc. Sometimes, people may even refer to a bulging disc as a “slipped disc” or a herniated disc as a “ruptured disc”. Although these terms are often used interchangeably to describe a similar condition, it is important to note that these two types of spine ailments are quite different. Let’s start with a brief definition of spinal discs, also known as intervertebral discs, along with their purpose and function. What Are Spine Intervertebral Discs? The spine is made up of a long column of bones called vertebrae and intervertebral discs that protect the delicate spinal cord. The spinal column, when functioning properly, allows for many different types of motion including flexion, extension, bending, and rotation due to these intervertebral discs! Each disc is made up of two parts: annulus fibrosus and nucleus pulposus. The annulus connects to each vertebra and is made up of tough and strong cartilage to protect the inner core which is called the nucleus pulposus. This nucleus acts as a cushion and is made up of a jelly-like material called mucoprotein gel, containing primarily water and collagen. Together, these two parts of each disc act as shock absorbers in the spine, connecting the vertebrae together and allow the spine to move. A herniated disc results when the inner nucleus breaks through the protective annulus wall and leaks into or around the spinal canal. Herniated discs are considered more severe than bulging discs because they put significant pressure on nearby nerves, which can cause intense pain, inflammation and difficulties with movement. A herniation can be caused by trauma, unusual compression forces, degeneration, desiccation, or even from lifting heavy objects. A bulging disc occurs when a disc in your spine literally bulges outside its usual area. It is considered to be “contained”, meaning the disc remains intact and mucoprotein gel has not leaked out. In other words, there is no rupture or tear outside the annulus layer of the disc. Still, there may be significant pain or dysfunction that can result because the disc is out of its normal shape, balance, and/or height. If left untreated, bulging discs have the potential to herniate. How Are Bulging Discs and Herniated Discs Different? 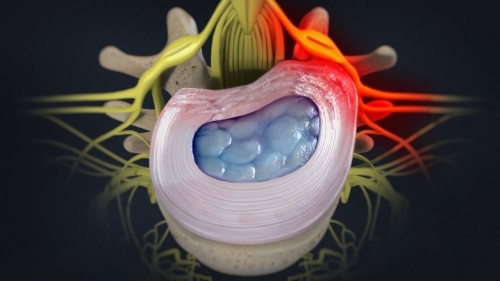 Bulging discs are more common than herniated discs. Generally, a bulging disc does not protrude far enough into the spinal canal to pressure or aggravate the surrounding nerves. However, acute pain and/or dysfunction is more common with a herniated disc. Pain may be triggered and/or intensified by actions such as bending, coughing and sneezing. Bulging discs and herniated discs have very similar causes. The most common cause is degeneration. As we age, the discs in our spine tend to dehydrate and stiffen, which often results in the discs becoming slightly compressed or flattened. Because of this, protruding discs are considered to be rather common as we age. While the aging process can’t be controlled, there are steps that can be taken to lessen the risk of developing a bulging or herniated disc, such as practicing good posture and safe lifting techniques, limiting participation in high-impact sports, and making positive lifestyle changes such as avoiding tobacco, eating a nutritious diet, and regular exercise. Bulging and herniated discs may be diagnosed by a primary care physician, a pain management doctor, or a spine specialist. They will typically review your medical history, perform a physical examination, and request imaging such as an MRI. If you are diagnosed with a bulging or herniated disc it is likely that you’ll start with the most conservative treatments, such as rest, medication or physical therapy, to help manage your symptoms. In severe cases, where pain or dysfunction persists, surgery may be suggested to provide a long-term solution. The most common surgical treatment for a bulging or herniated disc is a discectomy. This is a minimally-invasive procedure in which the spine surgery specialist removes the damaged part of the disc. If the disc problem is in the cervical spine (neck), an anterior cervical discectomy and fusion is typically performed or in some cases, an artificial disc procedure. If pressure on the nerves, spinal cord or cauda equina needs to be relieved, the discectomy is typically performed as a spinal laminectomy. If you are experiencing back pain, call your primary care doctor to schedule a physical examination. If you are in The Woodlands, TX, and your doctor has recommended you see a spine surgery specialist, request an appointment with Dr. Fayaz.